An artistic tribute to the simplistic, organic beauty of the Papyrus Plant, DecorShore's large metal wall sculpture carries a story important in the evolution of our human experience as it advanced the progression on man's journey to modern-day. Our artisan handcrafted wall hanging is a large size, 33 in. x 28 in, perfect for stylishly complementing a variety of interior design styles. Featuring thick stalks drawn upward toward thread-like, fan-shaped stems. The antique brass finish is reminiscent of golden sunsets reflecting on the Papyrus stems blowing in the breeze. In Latin, Cyperus papyrus played such a pivotal role in the lives and culture of Ancient Egypt that it was frequently depicted in hieroglyphs as well as in the artistic carvings seen on pillars in tombs & temples and as the subject of dated decorative art pieces. The very sight of tall, green reeds scattered in dense thickets amongst the marshes of the Nile River Delta and the Lower Nile Valley was symbolic of fertile land and known as an essential component to ancient survival. The Papyrus stalks provided nutrition and provided a rare resource amongst lands lacking foliage for use in building materials. The Ancient Egyptians used nearly every part of it; as a food source, in the production of rope, baskets, sandals, mats and crude boats. Of course, most famously, Papyrus was the first form of plant-based paper used in the composition of scrolls, drawings, archaic judicial documents, medical illustrations and more. Papyrus was widely used as paper in the form of scrolls until somewhere around 1,000 A.D. when it was replaced with parchment and vellum. Undoubtedly, over the course of thousands of years, this marshland plant played a pivotal role in shaping human development and technology. DecorShore is proud to present an artistic tribute to this botanical wonder. An artistic tribute to the simplistic, organic beauty of the Papyrus Plant and Its Pivotal Role in History. 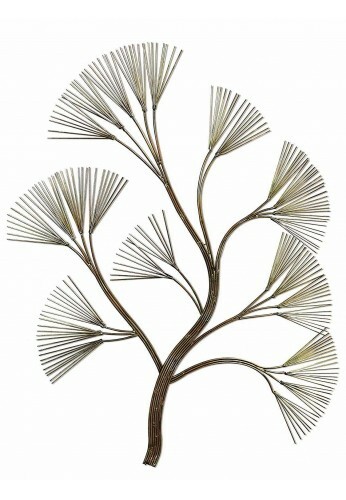 DecorShore’s ”Gift of the Nile," Brass Papyrus-Plant-Inspired Metal Wall Hanging is Perfect for Living Rooms, Bedrooms, Dens, Offices, the Study, Entry ways and More. 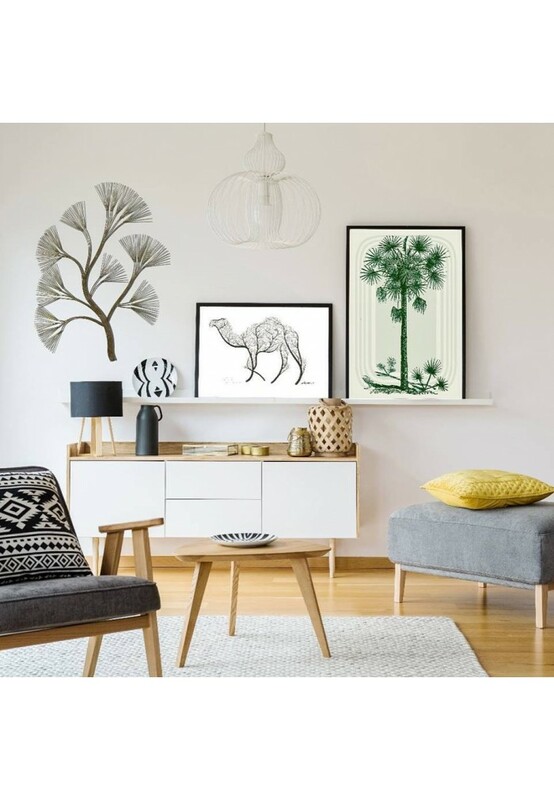 Perfect for Stylishly Complementing a Variety of Interior Design Styles. Featuring Banded Stalks Flowing Upward Toward Thread-like, Fan-shaped Stems and Clad in a Minimally Distressed Antique Brass Finish. Large Size Hanging Wire Sculpture - 33 in. x 28 in. x .4 in. - 3D Wall Art Creates a Stunning Artistic Visual. Read the Full Product Description For More on the Artisanal Inspiration. DecorShore Home Decor Metal Wall Accents - Always Unique & Handmade by Expert Metallurgy Artists. Eco-friendly Post-Consumer Recycled Packaging Can be Recycled Again After Opening. Should You Need to Return the Item, Save Packaging for Return. Clean Using Dry Microfiber Cloth for Dusting. Any Stubborn Spots Can Be Cleaned Using a Water-Dampened Microfiber Cloth to Wipe Clean.